Can You Bake Gouda Cheese in Pastry Wrap? 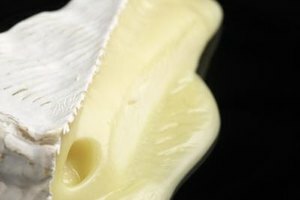 Brie is enclosed by an edible white mold. 1 Can I Prepare Baked Brie Ahead of Time? 2 Can You Bake Gouda Cheese in Pastry Wrap? Brie's mild flavor makes it an ideal base for a variety of sweet and savory toppings. While Brie is soft enough to spread at room temperature, it is often served baked in a puff pastry crust. Baked Brie looks impressive on a buffet or appetizer tray, but it is not difficult to make at home. Once you master the basic technique, experiment with various toppings to create baked Brie appetizers that will complement any meal. To determine how much Brie you need, first decide whether the baked Brie will be your only appetizer, or simply one of many hors d'oeuvres at your party. If you want to make baked Brie the star, you'll need a four-inch wheel (about eight ounces) for every five to nine people. If you'll have several appetizers, a four-inch wheel of Brie will serve eight to ten. If you are planning a larger party, you can purchase a larger wheel of Brie or make two or more small ones with different toppings. Tough Choices: Sweet or Savory? Brie's mild flavor invites experimentation with both sweet and savory toppings. Before you wrap the Brie in puff pastry, spoon a tablespoon or two of your favorite jam on top of the cheese. The jam will melt, creating a fruity glaze. If you prefer a savory topping, add caramelized onions, roasted garlic or your favorite herbs instead. If you just can't choose between sweet and savory, mix the two flavors. Try dried cherries or cranberries with sage or thyme for a sweet and savory Brie. A puff pastry crust provides both contrasting texture and a nifty enclosure for your gooey baked Brie. Start by wrapping the cheese loosely in the puff pastry so that it is completely enclosed. If the puff pastry is not large enough to completely seal in the wheel of Brie, cut another piece of puff pastry large enough to drape over the top. Wrap the original piece of puff pastry up over the top piece. Use an egg wash to seal the two pieces of puff pastry together. Brush the egg wash over the entire crust to give it a perfectly golden brown color. Bake at 425 degrees Fahrenheit for 20 minutes, or until the puff pastry is fully cooked and browned. Baked Brie can range from warm and soft to oozy, depending on your preference. You can control the consistency of the Brie by varying how long you let the Brie sit after you take it out of the oven. You should let it sit for at least 5 to 10 minutes after baking to firm up, or the cheese will be too runny. As soon as you cut open the puff pastry, it will flow out and make the whole dish soggy. If you let it sit for just 10 minutes, the Brie will be quite soft and will ooze out of the puff pastry shell. 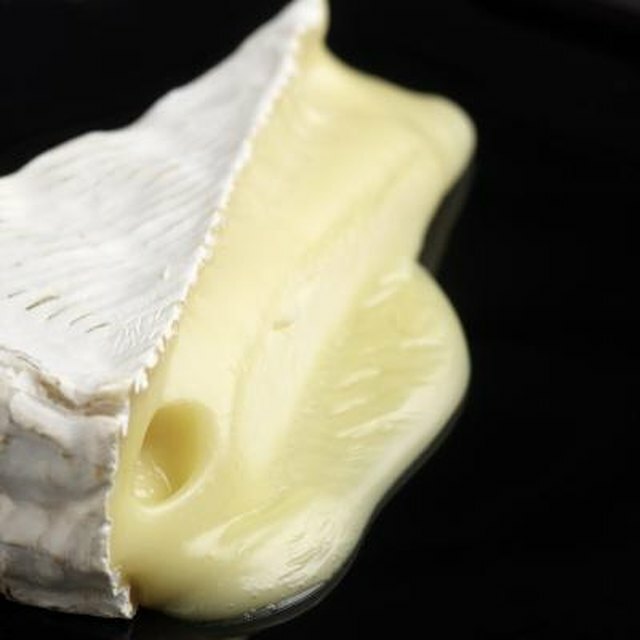 Let it sit for 20 minutes and the Brie will be creamy and spreadable without losing its shape.